OVERVIEW Now you can take all those stacks of 35mm, 127, 126, 110, 35mm Archive Slides / Negatives, 8mm and Super 8 movies and convert them into digital JPEG images to share and preserve them forever. 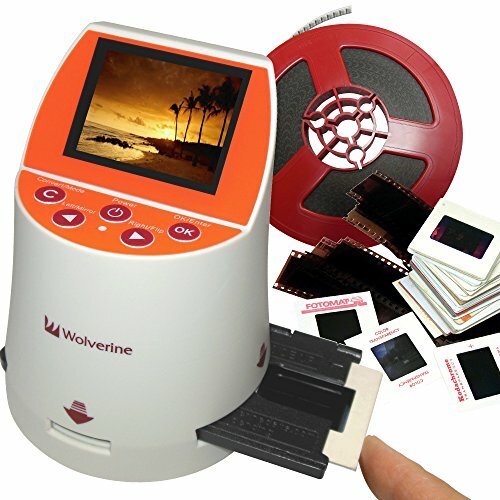 Wolverine has created a very simple to use device to convert all your film into 20 Megapixels digital images in seconds. So simple to use, it only requires a push of a button. No computer or software is needed. Use it right out of the box to convert all your film by plugging it into an AC outlet or any USB port. All images are saved into its internal memory or optional SD/SDHC memory card. Easily connects to any computer PC or MAC, to offload images or view them direct onto TV’s (TV Cable not included).Features Convert 7 type of Film into Digital in SECONDS Converter of Slides & Negatives into digital JPEG’s for 35mm, 127, 126KPK, 110 and 35mm library Archives Take JPEG snapshots from your 8mm and Super 8 Reels and recompile into a video UNIQUE Speed-Load adapters for fast loading of slides & Negatives Stand-Alone no computer required Save images to internal memory (holds min. 40 images) or optional SD/SDHC cards2.4" Color screen TV-Out jack to view images on TV (cable not included)Brightness and color auto & manual adjustment Specifications Max digital image resolution: 5472x3648 Pixels (20 Megapixels)Exposure: Auto & Manual Color Balance: Auto & Manual Data Conversion: 24 bits per color channel Convert method: Single pass Light Source: LED backlight Screen: Color LCD 2.4" LTPSSD/SDHC Card Reader Power Source: 5V DC Interface: USB Dimensions: 4 x 3.5 x 4 inches Weight: 0.5 lbs. Compatible with all Windows and Mac Operating Systems Box Weight & Dim: 2 lbs., 6.2x5.4x4.1 inches IncludedF2D-Mighty Unit135mm/127/126 Slides Adapter110 Slides Insert135mm Negatives Strip Adapter110 Negatives Strip Insert8mm and Super 8mm Film Insert AC-USB power adapter USB Power/Data cable Cleaning Stick User Manual. 2.4" Color screen.TV-Out jack to view images on TV (cable not included).